In SQL Server 2008 R2 each package using a connection has its own connection manager. Here we assume that lots of packages are going to want to use the same connection, so we've created this as a project-level connection manager. 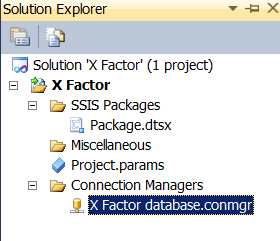 Time to look now at a brand new task in SSIS 2012: expression tasks.